I was out and about for a drive over the weekend with the Hubs and I decided to snap a few photos. Then when I got home I decided to add some digital magic to them. So I thought I'd share them with you. I'm looking forward to the temps getting more spring-like so that random weekend drives will be more frequent. Let the flowers bloom, Mother Nature. I'm totally ready for Spring! With Spring (seemingly) on the way, I was inspired to paint something with flowers over the weekend. And since I'm drawn to poppies a lot, I decided to do another poppy painting, but do it a little differently than I'd normally do. I wanted to create some texture, so this time I used some modeling paste on the canvas to give my Red Poppy a bit more dimension. AND, I decided I was going to paint a bit more loosely and not be so obsessed with perfect lines and edges. So this was the result. I've used acrylics here, plus paint pens and a wee bit of Pitt artist pen too, and of course the modeling paste just to give the poppy the texture and dimension I was looking for. At first I was not loving this. At. All. 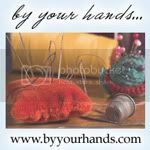 I get so muddled down in details and making sure everything looks perfect sometimes. So it was a real challenge to paint more loosely and not worry so much. I actually hated this at one point and wanted to start over! But just at the point that I was about to give up--I kept going and within a few minutes I could see it becoming what I wanted it to be. And guess what? Now I love it! So much so that I think this will get hung at the farm house when the Hubs and I move (hopefully later this year). I felt like doing something a little different in the studio yesterday. Something moved me to do a horse painting, so that's what I did. But I made my horse blue for a touch of fantasy. First I'll say that this looks better in person than it does in the photo. Neither my scanner nor my camera seemed to want to capture a good image today for some reason. But I think you'll get the idea. The horse is done in Inktense pencils. If you've never used Inktense, they come in both pencil and block forms. I have both, but I used the pencils on this. The pencils work much like watercolor pencils, in that you draw with them and then add water. Only with Inktense, the "leads" are made with compressed ink pigment instead of watercolor. The ink becomes super vibrant once it's wet, and adding any wet media (water, gesso, etc) is what makes the color permanent. So with the horse I drew him in regular pencil, then outlined with Inktense. 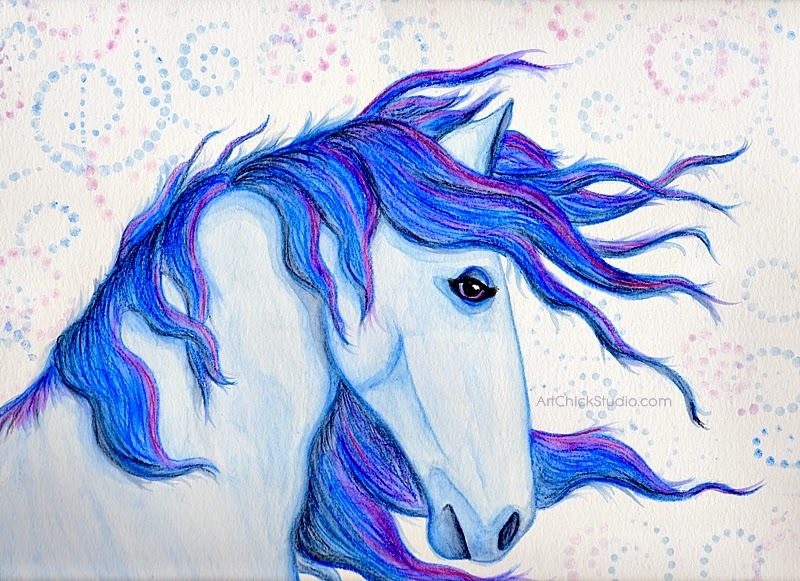 Then I added water, then added more Inktense and more water, and I kept repeating that until I was happy with the horse. I did the background with Inktense and stencils. There's a tiny bit of Pitt pen that I used on the horse's eye, so with that this is technically a mixed media painting. But it is mostly Inktense, and it's done on watercolor paper. I've never really painted a horse before. I did do a unicorn with my recent Unicorn Girl painting, but that was a little more whimsical than this. I love how it turned out, and I don't think it's too shabby at all for my first horse. Who knows, maybe I'll do another one of these days. 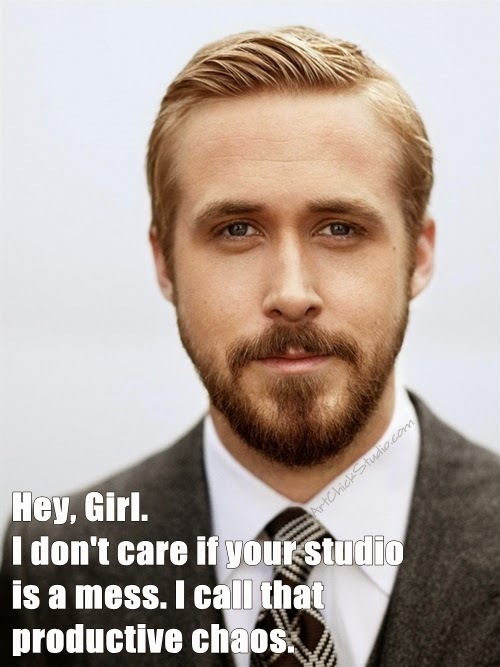 If you follow Art Chick Studio on Facebook, then you know I'm rather a fan of the "Hey, Girl" Ryan Gosling memes. I make some of my own from time to time, and I share others I find on FB too. 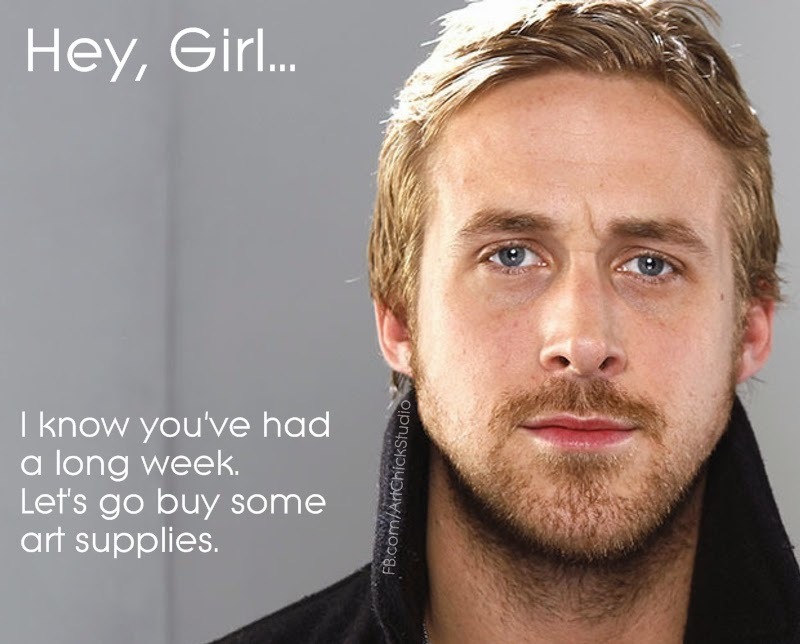 I'm not sure how those Hey, Girl memes ever got started, but some of them are so hilarious. It didn't take me long to become addicted to them. So, to help fuel my addiction, I decided I'd start sharing some of those memes here on the blog. :) Here are a couple that I've made myself. More to come in the future, as I find some and/or make more of my own. Have a great weekend. I finished this art piece last weekend while in the studio. It was a commission by one of my former art students. She wanted something for her daughters' bathroom--something abstract. She wanted me to use purple and bright green, since those were her bathroom colors, but the rest she left up to me. And this was the result. This is mostly acrylic paints. I scraped the background colors on with an old credit card. The circles were made with various lids in my studio and a few other round things here and there. I added some details with markers and paint pens too. It was fun to create and I was so glad to be able to do this for them. I was looking through some old artwork last night and decided to have some digital fun with some old oil paintings. 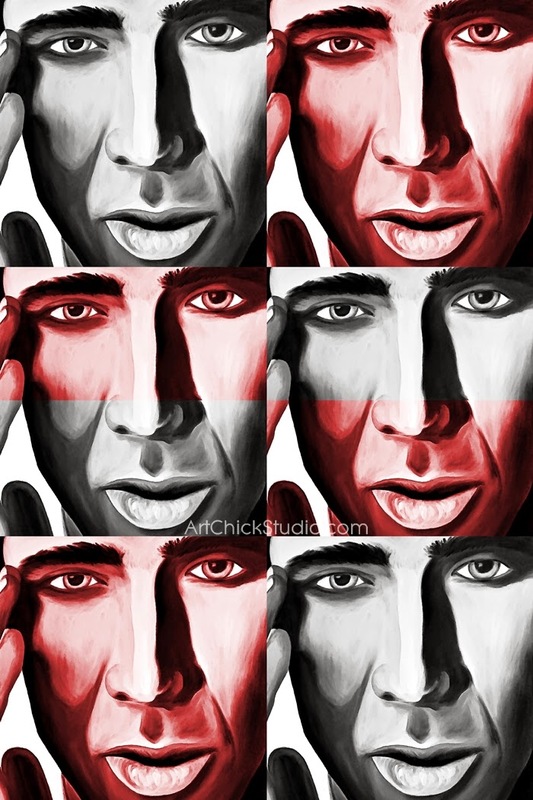 This one is based on a portrait of Nicolas Cage that I did several years ago. The original is all in blues, but I felt like changing it up. I was thinking about my mom a lot the past week. That's nothing new. But this time it inspired a painting, which I created in the studio over the weekend. I used Inktense Blocks for the background, kind of as an experiment--because they're so vibrant. The silhouettes are done in acrylic. And the text is acrylic stamping. The words are from a Leona Lewis song that I love called, Run. And every time I hear that song I think of my mom. It's just a reminder for myself that even though she's no longer here, she still beside me, always. 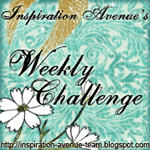 I haven't done a Three Muses challenge in awhile, so I decided to participate in this week's challenge, which is called The Sky's the Limit. I didn't create something brand new though. 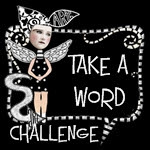 Rather, I took a page from one of my art journal's and transformed it into new digital Fairy Art. My original piece is called BECOMING YOURSELF. <--If you click on that it will take you to that original blog post. I cropped the photo a bit and then added my digital magic. And of course, this digital art features the art of one of my favorite artists, Maxfield Parrish. 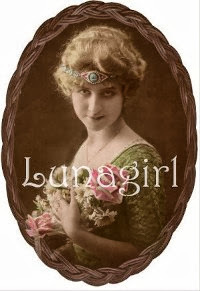 I turned his lovely lady into a fairy. And I really like how this art journal page turned digital art came out. I was actually able to get into the studio twice over the weekend--that was a rare treat. I was working on some ideas for various paintings and projects, and I also created this new Mixed Media painting. She's my Pretty in Purple Mixed Media Girl. Now the thing to know about me is, I'm not really a fan of purple. I don't hate it or anything, but it's just not a color that I gravitate to in the studio (or anywhere else). The only time I wore any purple shirts on a regular basis was when I was in college--because my school colors were purple and gold. But beyond that, purple has never been my thing. But if you look at the girl in the painting, she's wearing a dress of purple and mint green flowers, and that scrapbook paper is actually what inspired this painting. I used lots of acrylics here, some stencils, paint markers, some tissue paper, and some Neocolor II crayons--all my usual suspects. I like how she turned out. I used yellow for her hair since it's a complimentary color to purple, so that always works. And I love how that makes her stand out on the canvas. And I didn't use any paintbrushes on the background paint--just a brayer and my fingers, so that was fun. I'm not sure if she's 100% finished though. I keep looking at her and thinking maybe I need to do something more to her hair. But I'll let that percolate for awhile and then see how I feel about it in a week or two.